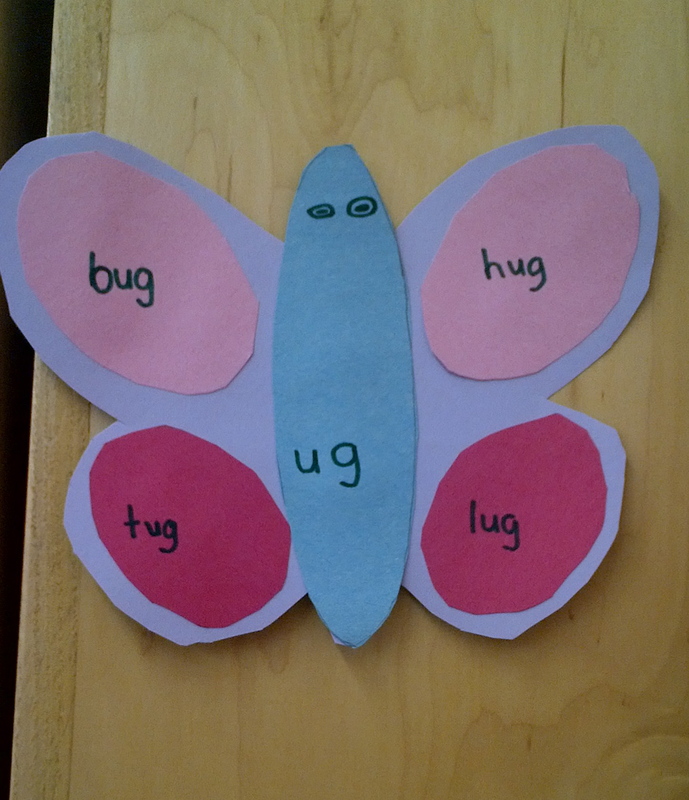 We have been working a bit on word families and our wrap up activity for the ‘ug’ family was a great success today so I thought I would share. I have to confess that these ideas not completely mine but I have taken the ideas of other and made them work for me. Please visit the sites I link to to get the originals. My class is bug obsessed right now. To capitalize on this I have made my SK required centres as bug based as I can. (We are a student led inquiry based class but at this time of the year my SKs have 5 required centres they must complete each week, to structurally prepare them for Grade 1). 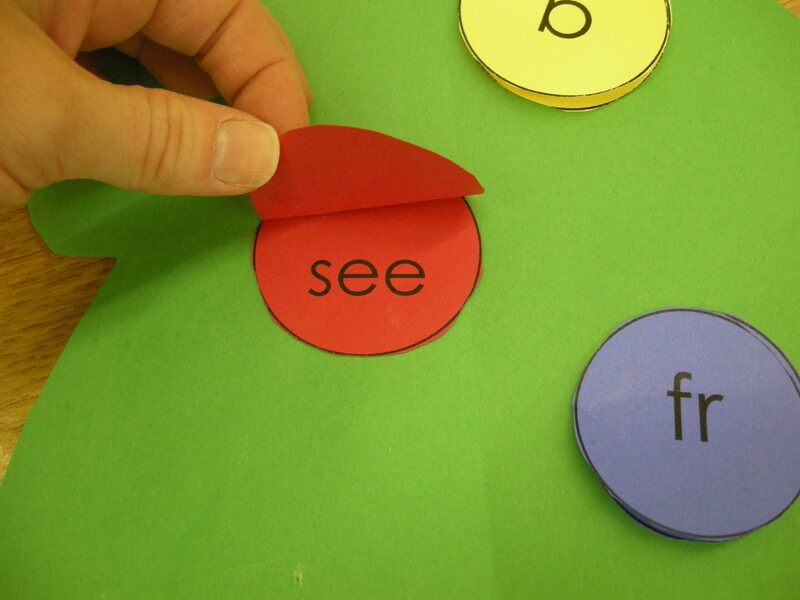 I found a cool free unit with literacy based bug activities on TPT. I found a number of sheets for students to record their lists of words in different word families. I decided that I would give them one sheet a week and ask them to write down any words in the word family that they could come up with. 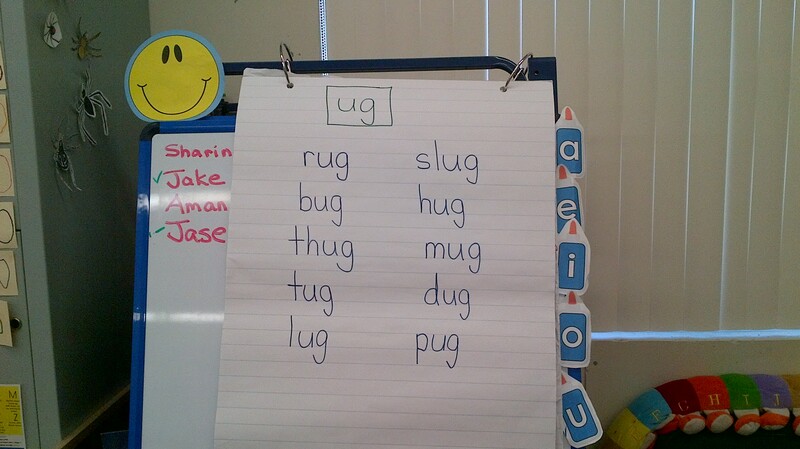 Last week I gave them the ‘ug’ sheet. Today we first made a class list of all the words everyone came up with. I then wanted to do a fun craft to reinforce the word family. 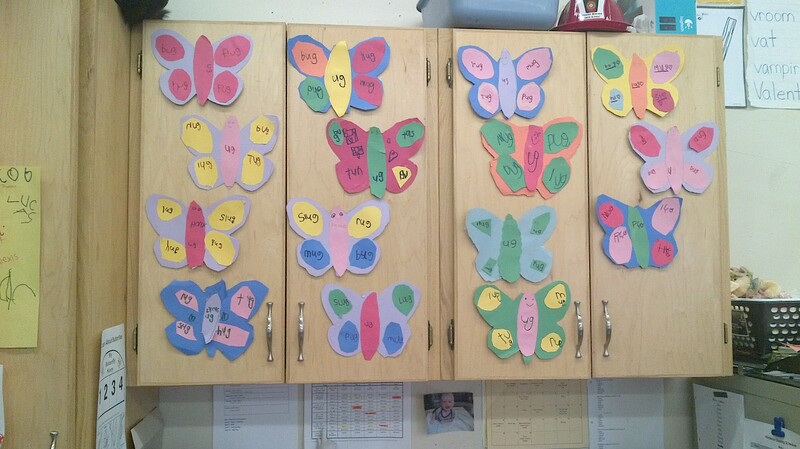 I found another cool activity (this time through pinterest) on using butteflies to practice word families. Butterflies are bugs so we tried it out. I printed and cut out 3 copies of the templates and Kaitlyn made us a template before school started. I gave them free range with their colour choices with the only requirement that they use ‘ug’ words off the list we made. They added some much needed colour to my teacher cupboard doors. I just love it when I come up with a great lesson for my Kinder class and it works well from start to finish! Today I had one of those lessons. 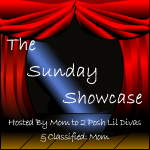 One of the blogs I frequently follow is Mom to 2 Posh Lil Divas and she has had a few great posts on activities to do with word families. I have been wanting to try and work some fun word family activities in with my class and had a great opportunity today. Our focus for the month of December has been around a great book: A Porcupine in a Pine Tree – A Canadian 12 Days of Christmas by Helaine Becker and illustrated by Werner Zimmermann. We are doing some a great sequencing and counting activity that I will blog about later but from this book our focus has expanded to include all Christmas Trees. A great big Merry Christmas tree. We circled all of the ‘ee’ sounds in the song and then I told them we were going to make a craft to learn more words with the ‘ee’ sound. There was a bit of prep on my part for this activity, so it didn’t take all day. 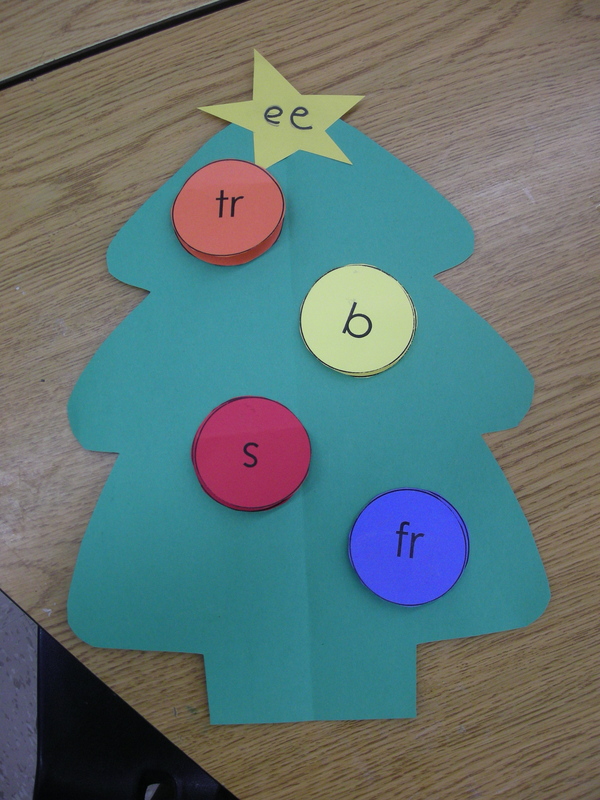 I had already cut out for each student: a green tree, a star, and four circles with ee words (free, tree, see, and bee). For each word there was a circle with the complete word, and a circle with the ee missing. Students started by printing their names on the back of their tree and the ‘ee’ on their star. I came around with a black marker and made their ee’s brighter. This gave me the opportunity to help those students who struggle printing lower case e’s but they still had to make an attempt themselves. Next we glued our stars at the top of the tree. One word at at time students glued the word on the tree and then the circle with the part of the word (missing the ee) on top so they could ‘peak-a-boo’ under the circle to see the complete word. After a few glue mishaps with completely cover the word most students figured it out and the trees were a success. 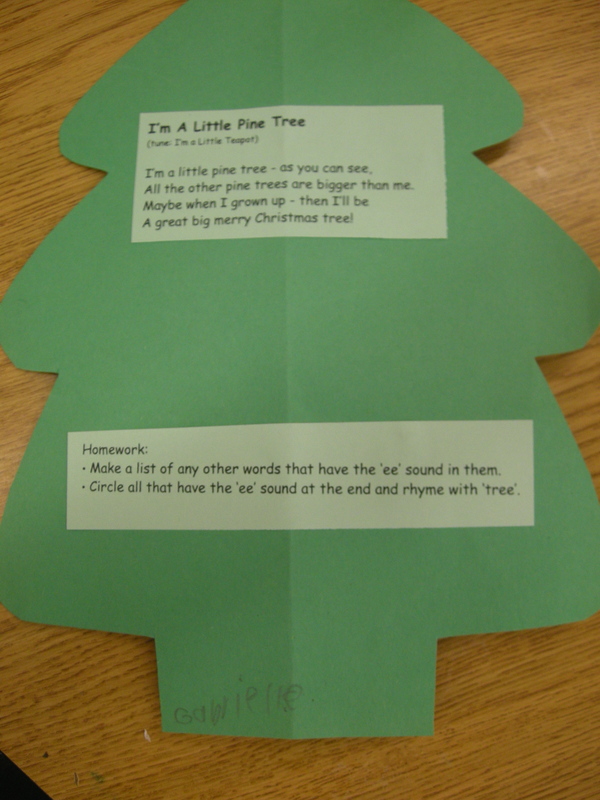 While they were in gym today I glued the “I’m a Little Pine tree” song on the back of the tree along with a small homework assignment. I asked them to talk with their parents and see if they could list any other works with ‘ee’ in them. Then they were to circle any that had the ‘ee’ and the end and therefore rhymed with the word tree. I am interested to see what they come back with on Monday. I will definitely be doing more activities like this one. I am thinking ‘og’ words around Groundhog day, and ‘ar’ words when we are studying space in February (star).